Subscriptions now available Subscriptions to our 2017 Season are now available. Visit our TICKETS page for purchasing options, or click on the link below to book online. 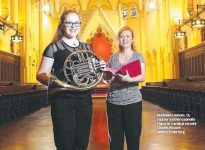 CLICK HERE to read Rod Bennett’s article from the Manly Daily, about our next concert. Photo by Annika Enderborg.